In today’s episode we speak with Rob Saunders about work done at the University of Sydney in computational creativity and curiosity. 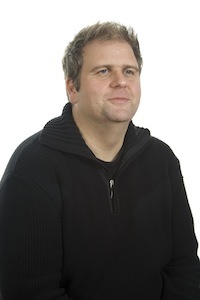 Rob Saunders is Lecturer in Design Computing and Faculty of Architecture, Design and Planning at the University of Sydney where he joined the Design Lab. In 1995 he gained a BSc in Artificial Intelligence and Computer Science from the University of Edinburgh and in 2002 he was awarded a PhD from the University of Sydney for his work on Curious Design Agents and Artificial Creativity. From 2002 to 2006 he lived in London where he worked on a number of interdisciplinary projects with artists, designers, and scientists including biological simulations of stem cell systems, an intelligent logo design system and autonomous artworks that have been exhibited in galleries across the UK and the USA. After his return to Sydney in 2006, Saunders focused his attention to exploring computational models of creativity. His research interest lies in understanding human creativity and producing tools that support it. His curious design assistants for example are interface agents that have been developed to support human creativity by filtering and exploring design spaces. Saunders also aims to build minimal and well rounded models of creativity at the individual, social and cultural level for autonomous systems that work independently from humans. Curiosity is one of the driving forces behind creative activity. As such, Saunders creates curious agents that are computational models of self-motivated learning based on interest in novelty. In this interview, Saunders tells us about his many projects in curious systems and his take on creativity.